Punctuation marks are a fairly curvaceous, party-going lot on the whole, so you’d be forgiven for raising an eyebrow at the blundering straight arrows they count among their bedfellows—the hyphen, the en dash, and the em dash. They’re often clumsily situated on the dance floor, but they’re a well-connected and powerful lot, so you’re probably going to want to learn to use them and exploit them for what they’re worth. The sentence above contains three kinds of dashes in their most common uses. The hyphen, en dash, and the em dash, are essentially dashes of increasing lengths—decreasing in intimacy. If the differing lengths of the dashes in the paragraph above was noticeable, you have a keen eye. If you’re struggling with why I used one over the others in particular situations in that text, read on. The hyphen (-) often describes the closest relationship between the words it binds. Two words that form a union as a unique concept (think great-grandmother versus fat old lady, an eye-opener in place of something that prises your eyes open, or re-covering your sofa versus recovering it), or function as a single part of speech, such as a compound adjective or noun (think 100-metre sprints versus 100 sprints, each a metre in length), are joined using a hyphen. In a world in which an increasing number of traditionally hyphenated words are losing their hyphens, it’s easy to think that we could easily do without hyphens. The following example from the Canadian Translation Bureau illustrates how incorrect placement of a hyphen in a headline could throw a reader way off track. Zoologists have discovered a mysterious new fungus that is killing the world’s frogs and toads, New Scientist magazine said on Wednesday. Recommending the preclusion of the hyphen doesn’t do much good either: If indeed the frogs were killing the fungus, not having a hyphen would create avoidable ambiguity. It’s easy to get bogged down with unending discussions of what compound words need hyphens and what don’t, and the most fastidious writers of style manuals typically list nonexhaustive—but thoroughly exhausting—lists of words that are and are not to be hyphenated. This post from the APA, on the other hand, summarises some key principles to help writers decide for themselves and to be consistent throughout a work. The en dash (–), traditionally the width of a typeset capital ‘N’, which gave it its name, has a lot in common with the hyphen, and is often erroneously replaced with the hyphen. Its correct use denotes elision, commonly of the word ‘to’ in a range, such as in “1939–45”, “Monday–Friday”, and “09:00–5:00”. Often, it can also be used to replace “between”, as in “Madrid–Barcelona match”, “wave–particle duality”, “Parent–Teacher Association”, and “France–Germany relations”. In such constructions, as opposed to hyphenated compounds, the order of the words can be switched without altering the meaning. You can, for example, use the en dash to rewrite “France–Germany relations” as “Germany–France relations”, but hyphens are used in compounds like “Anglo-American” or “Sino-Japanese” because you can’t switch the order of the words in these compounds. The em dash (—), often called the ‘long dash’ by non-specialists, is better known than the en dash and is recognisably longer than the hyphen—and therefore less-often confused with the hyphen. It is traditionally the width of a capital ‘M’ (hence its name), and can be used to replace a variety of typographical marks including the comma, the semicolon, the colon, and parentheses to set an aside aside. (In some regions and styles, an en dash with spaces on either side is used for this very purpose.) Although the pragmatics of its use are hotly contested, em dashes are often less formal than colons or semicolons, invoke a longer pause than commas, and are more attention-grabbing than parentheses. They are also often used to indicate interrupted speech or an interrupted train of thought, as used in a Vox article containing a transcript of Trump’s comments. While the em dash can be very elegant indeed if used correctly, it’s easy to begin to overuse them, and the exceeding elegance of its sparsity can soon turn into clumsy clutter. Because they’re a fairly expansive punctuation mark, they very quickly make a block of text difficult to read if overused; try reading that Trump transcript again. 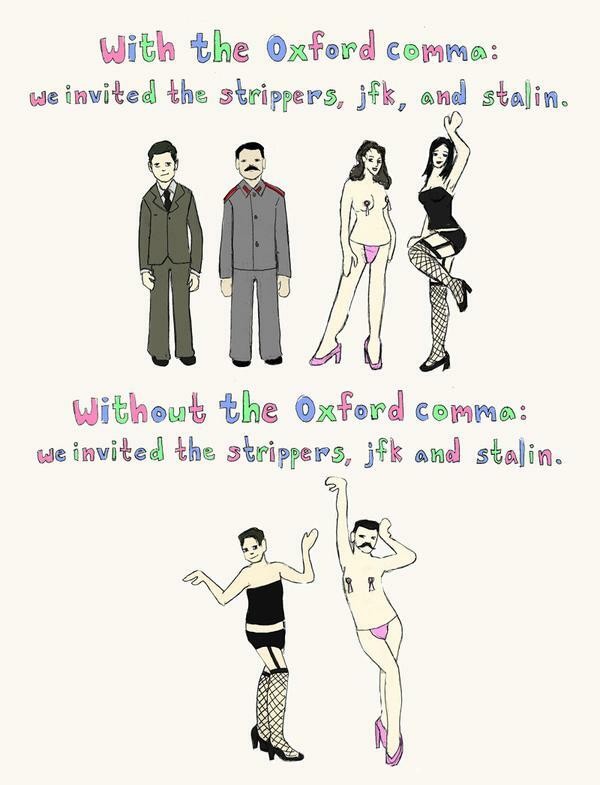 Many of you will have seen the comics that abound the internet about why punctuation is important, ranging from the use of the direct-address comma (Let’s eat grandpa) to the Oxford comma (We invited the strippers, JFK and Stalin), and on to the colon (A woman without her man is nothing). 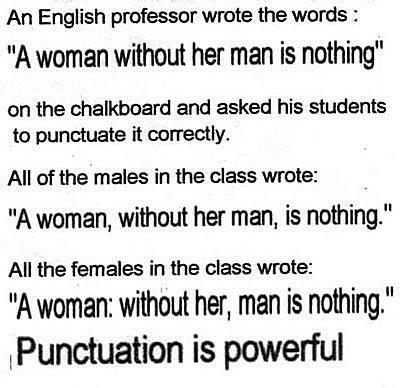 It may indeed be hard to see how a misused hyphen, en dash, or em dash might result in cannibalism, war, or being thought of as a misogynist, but good punctuation is about more than just such theoretically possible but highly improbable results. Dotting your is and crossing your ts with obsessive scrupulousness in everything you write is a little like turning up to a beach party in a three-piece suit—you simply end up looking like a douche. 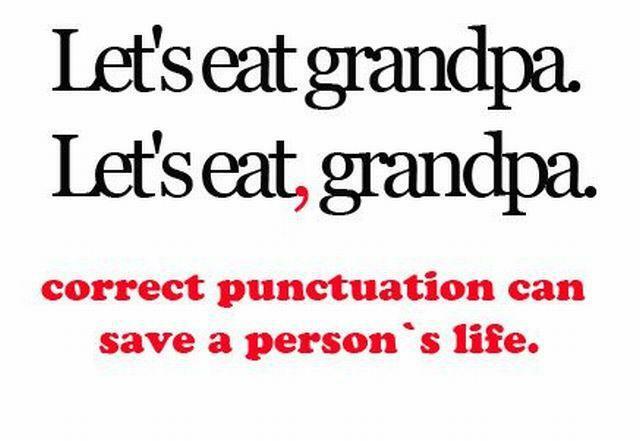 But punctuation is important to aid the comprehension of your reader and it conveys a degree of professionalism and attention towards your work and respect towards your reader. While incorrect punctuation in very specific contexts such as legal writing can cost you a million dollars because someone interpreted your writing differently from what you intended, for the vast majority of us, the financial risks are negligible. Little can go wrong if you make errors in a Whatsapp conversation with your mates. That being said, though, if you’ve received absolutely unintelligible text messages from a relative who refuses to use any punctuation whatsoever, you certainly share my frustration. For example, the following sentence (used in multiple grammar books), is much more easily read if punctuated. James while John had had had had had had had had had had had a better effect on the English teacher. James, while John had had “had”, had had “had had”; “had had” had had a better effect on the English teacher. You’ve probably read a poorly punctuated billboard advertisement in your neighbourhood at some point (otherwise, choose at will from this article). Even if you didn’t notice it the first time you saw it, social media is unforgiving, and you and the rest of the internet are now probably laughing at the company that goofed up. Good punctuation conveys professionalism in your work and respect to your readers or viewers. I can be fairly confident in saying that the people responsible for those poorly redacted ads are unlikely to have gotten any repeat clients. If you don’t often pay much attention to punctuation in text messages or emails, I’ll wager you try much harder when texting your boss, emailing a client, writing a Christmas greeting to your doctor, or a complaint letter to your municipality. This could be as much a matter of respect as of professionalism and a desire to be taken seriously. Top magazines like The New Yorker, newspapers such as The Guardian, news agencies like the Associated Press, and publishing houses get every article or document edited and proofread multiple times. Just like nobody would hire a hairdresser with untidy hair or trust a chef with a blunt knife, sloppy editing calls into question other aspects of the work writers and journalists do: their training as writers or the quality of their research. The bottom line is that punctuation exists as a comprehension aid, much like good handwriting, spelling, and grammar. Different situations call for different levels of attention to detail, but punctuation can be effectively used to convey varying degrees of seriousness to your reader. In addition, rarer punctuation marks such as dashes can add sophistication to most texts when used correctly. With the guidelines in this article, you’re in little danger of misusing them, but be wary of overuse. Eventually, though, while some of us insufferable and very vocal pedants will still criticise you, it really doesn’t matter if you use a hyphen instead of an en dash in “Parent–Teacher Association” or “France–Germany relations”. Being consistent throughout a work usually works, so read and re-read your work to show you’ve made an effort. Then brace yourself and prepare to be judged on the merits of your content alone.